The Vincentians and their Guyanese counterparts lock horns from 5 p.m., in the first of the double-header, which will be completed when the host faces off with Curacao from 7:30 p.m.
Vincy Heat and the Golden Jaguars last met in a friendly international here at the Victoria Park, on February 20, with the host coming away one-nil winners. Vincy Heatâs next meeting will be against St Lucia from 8:30 p.m. on October 23. Before them, Curacao and Guyana play from 6 p.m. The Vincentians round up their campaign when they engage Curacao from 6 p.m. on October 25. The group closes off with Guyana meeting St Lucia from 8:30 p.m.
Guyana, which is also in semi-finals of the CONCACAF group of 2014 FIFA World Cup, is the highest ranked team in Group 2, as they are currently 122nd on FIFAâs list. 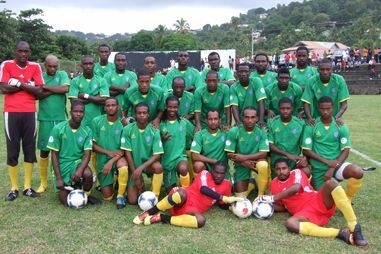 St Vincent and the Grenadines stands at 137, while Curacao is at 161 and St Lucia at 184. The Caribbean qualifiers consist of five groups, with the top placed team in each group automatically advancing to the next round. Also with a chance at the second round are the runners-up from Groups 1 to 3, who will advance to the second round. The best runner-up from either Group 4 or Group 5 will also advance. Martinique, Suriname, Haiti and Puerto Rico have secured places in the next round, as Groups 1 and 3 have been decided. Barbados is hosting Group 4, which began on Sunday and concludes on Thursday. The others in the group are Aruba, Dominica and the Dominican Republic. The next group to be decided will see Trinidad and Tobago, French Guyana and Anguilla contesting Group 5 from October 10 to 14, at the Warner Park in St Kitts. The second round will comprise three groups of four teams with Grenada, Guadeloupe and Cuba seeded in one of the groups. In the second round, Grenada will host Group 6, Guadeloupe will stage Group 7, while Trinidad and Tobago will host Group 8. The top two teams from each second-round group will advance to the finals December 3-16 in Antigua and Barbuda, with the host nation and two-time defending champion Jamaica.